The aim of this model curriculum is to outline how public health ethics can be integrated into public health education and training. We suggest that ethics ought to be seen as an essential cross-cutting requirement for all those involved in public health practice and policy making. Engaging with public health ethics will result in better decisions, improvements in the health and satisfaction of the public, and enhancement to workforce knowledge and skills. Public health ethics is an essential aspect of modern professional public health activity and it ought to be integrated into relevant entry-level and continuing education and training programs. This curriculum outlines six modules as follows: health protection, health surveillance, disease and injury prevention, population health assessment, health promotion, and disaster response. 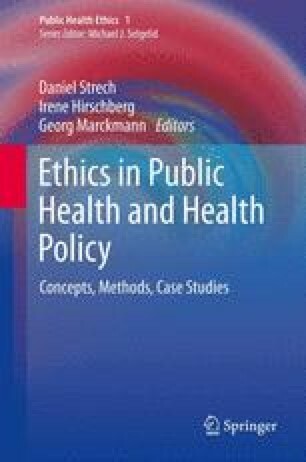 The aim of this chapter is to begin a discussion about what is central to ethical discussion in public health, and to encourage the development of the ability to comprehend, critique and discuss key theoretical concepts, develop skills in argumentation and the capacity to identity and explore the interaction between ethical, legal, and methodological issues. This project was originally funded by the Public Health Agency of Canada (PHAC) and carried out at the Joint Centre for Bioethics, University of Toronto. For this reason some of the discussion relates to a specifically Canadian context. However, the model curriculum is, we would argue, relevant to all working in public health across the world. We are grateful to Ryan Melnychuk and others at PHAC for their help and support for this project.